I found that sometimes during the outpost attacks if I move my character to a spot while attacking the human defenders and he gets hit by a ranged weapon with an overwatch attack then my character will lose their second action point and cannot attack during that turn. I've noticed this multiple times now. At first I thought my finger might have slipped and moved my character too far, but this last time I'm positive that I moved him to a spot where he would still have one action point remaining, but it says that character has used all their action points for this turn. I never noticed this happening before the 2.2 game update. 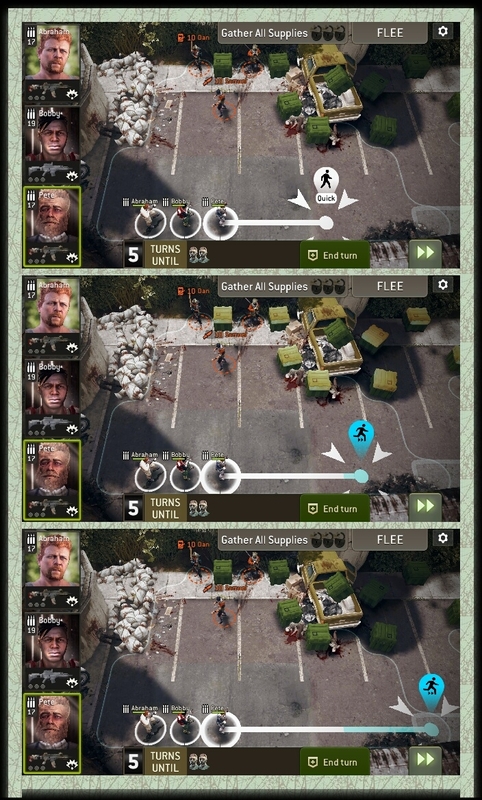 @justinc222 , next time it happens see if there are any text over your survivors like interrupted. Most likely the defenders have weapons with the interruptor trait. And they probably interrupted you after your first ap movement. if you get hit going into your second ap you lose the rest of that move. you can tell when your going into second ap by the dot or cross turning blue as well as the movement line. if you get hit(and interrupted) before it would turn blue you keep the other ap (you can continue a new 1 ap move or go into overwatch), if you get hit after you lose the ap, and if they miss you just carry out the move with the pause saying you dodged. Ohhhh I totally forgot about Interruptor. Good call, guys! Thanks for fixing my foolish brain @zbot and @Necroboogie !